Updated May 2014 by Patrick Long, incorporating Navy enlisted promotion system changes announced by Navy Administrative Message (NAVADMIN) 114/14. In the Navy, promotions to the paygrades of E-4 through E-7 are competitive. That means sailors compete against other sailors, within their same rating (job) for available promotion slots. In order to determine who gets promoted, the Navy, like the other services, use promotion points. Basically, there are limited promotion vacancies within each pay grade for each job. When determining who gets promoted, those with the most promotion points are the ones who get the stripes. Chief petty officers (E-7 to E-9) from each Navy rating develop advancement examinations. The examinations consist of 150 questions. Generally, 135 questions pertain to the rating (job) and 15 questions pertain to general military subjects. Examinations are administered to most candidates worldwide on the same day. Examinations are given according to a set schedule at locations and times that are announced in advance. The standard score is a reflection of how well you did compared with your peers taking the same test. The Navy first averages all the scores to get the "arithmetic mean," and then average how far each score is from the mean. Your score is a direct reflection of any relative difference. Say, for example, you not only scored higher than anyone else but scored way above the next highest candidate. Your score would reflect that and be relatively higher. On the other hand, let's say you had the highest score in a huge group of high scorers. You would still have the highest standard score, but it would be only slightly higher than the next highest score. In a general way, a standard score of 20 means no one scored lower, 30 only 2 percent scored lower, 40 about 15 percent scored lower, 50 is average, 60 only 15 percent scored higher, 70 only 2 percent scored higher, and no one gets higher than 80. (80 is the highest possible standard score on Navy Promotion Examinations). For more information, "standard score" is covered in all introductory statistics books in a chapter on descriptive statistics. To calculate the Performance Evaluation Promotion Points or PMA (performance mark average), used in the chart below, one simply uses the average of the ratings received while in the current paygrade. Add up the marks received in the current paygrade, then divide by the total number of evaluations. Carry to three decimal places and round up/down (less than 5, round down, 5 and up, round up). 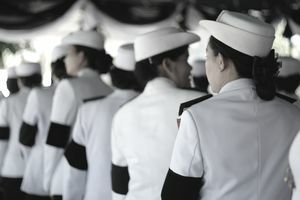 PNA points are awarded to E-4 through E-6 candidates who achieve a relatively high score on previous Navy-wide advancement examination/have relatively high-performance mark averages during an examination cycle in which the candidate competed for advancement but was not advanced because of quota limitations. PNA points are comprised of written examination standard score and performance mark average. PNA points are only creditable from the most recent five exam cycles in that pay grade. PNA points are only awarded to the top 25 percent of Sailors not advanced; 1.5 PNA points go to the top 25 percent of Sailors by test and 1.5 to the top 25 percent by performance mark average. Total PNA points are determined from a Sailor's last five advancement cycles, capping at a maximum of 15 possible points. Again, only PNA points from the last five promotion cycles can be carried over to the current cycle, and the maximum number of points (after they are multiplied by 2 according to the below chart) are 30. For promotion to E-7, the above factors are just the first step and are used to determine which E-6s meet the promotion board, and which do not. Those E-6s who score (total points determined above) within the top 60 percent of each rating (job), go on to have their records evaluated by a Navy-wide promotion board. It's the promotion board who then determines who actually gets promoted, or not, depending on the number of available promotion vacancies.